A 2 x 6 in. (38 x 140 mm) wall with higher efficiency insulation. A 2 x 4 in. (38 x 89 mm ) wall with exterior insulation. 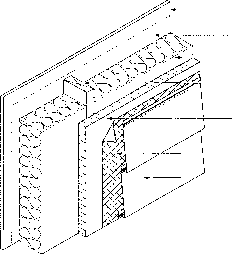 rigid insulation applied to the outside either in place of, or in addition to, the normal sheathing (Fig. 124). 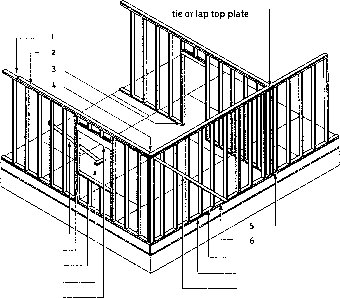 This latter method has the merit of providing a significant proportion of the wall's thermal resistance in a form which is continuous over the framing, thus reducing heat loss through the framing members. 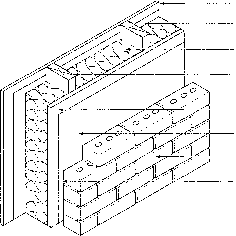 Some types of semi-rigid insulation come with a spunbonded poly-olefin sheet attached to one surface. This material Is vapour permeable but air impermeable, and can constitute a good air barrier if the joints between the sheets are taped. Materials such as spunbonded polyolefin or perforated polyethylene are available in 4 and 9 ft. (1.2 and 2.7 m) rolls, and can be applied to the exterior of any wall assembly to create an effective air barrier. Other types of insulation, such as rigid plastics, have low water vapour permeance and are also air and water impermeable. If they are placed with the joints butted and caulked, they could also form a good air barrier. The use of a sheathing membrane on top of the insulating sheathing is required as a rain-shedding device, unless the joints in the sheathing are sealed or designed to shed water. 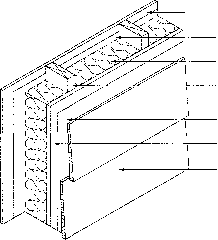 Loose-fill insulation is not permitted for walls since the cavity must be closed in before the insulation is installed, and this makes it difficult to ensure complete filling of the cavity. In addition, loose fill insulation may settle and create a space at the top of the cavity when disturbed by vibration. However, a number of blown-in blanket systems (BIBS) of insulation are permitted which inject loose-fill Insulation in conjunction with a binder, such as latex, to provide a semi-rigid, blanket-like wall insulation. Except where unavoidable, electrical and mechanical facilities such as boxes, pipes and ducts should not be installed in exterior walls. Where this cannot be avoided, insulation should be fitted tightly around the item in question and between the item and the outside surface in a manner which will minimize compression of the insulation. Insulation for small spaces at intersections, corners and around openings should be cut only slightly oversize and carefully installed to avoid bunching and excessive compression. Walls between dwelling units and garages should be insulated to the same degree as exterior walls whether the garage is heated or not, since garages are often left open for extended periods.